U.S. Secretary of Education, John B. 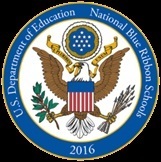 King, Jr., announced today that Van Vleck Elementary has been named a 2016 National Blue Ribbon School. Van Vleck Elementary is one among 279 public and 50 private schools receiving this honor. District and Campus administration will represent Van Vleck ISD at a two-day awards ceremony in Washington, D.C., to celebrate their hard-won achievements in November. To view Dr. John B. King, Jr.’s announcement from earlier today, click the following link. Congratulations to the students, staff, parents, community members at Van Vleck ISD for their collaborative effort in making our schools successful.